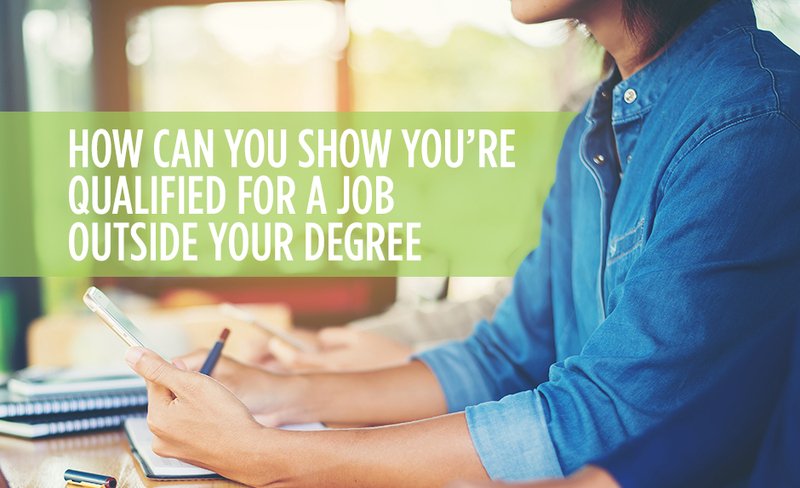 How Can You Show You're Qualified for a Job Outside Your Degree? Many job seekers become interested in moving to a new position from the one they had in the past or the one they trained for. Trying out something new can give candidates a chance to use their skills in different ways and can help job seekers escape from a career rut. For those who have gotten degrees and discovered they don't like the field they studied for, working in a different industry can become essential to have a happy and productive work life. Rework your resume to highlight experience that aligns with the job description. Companies typically will not consider the resume of a candidate who does not show practical, real-world experience and does not immediately demonstrate they have the skills the job ad mentioned. Consider the skills and abilities the job ad requests in a candidate and think back over your past work experience to highlight all the different accomplishments you have that demonstrate your talents in the desired areas. Provide concrete, quantifiable evidence the skills you have acquired translate directly to your ability to fill the open position and add value to the hiring organization. Focus on the past positions you had that are most relevant to the current job: Make it easy for the hiring manager to see you have the skills and abilities they are looking for. Include only relevant positions that relate to the job you are applying for, and write your job descriptions from past positions to emphasize the skills that transfer well to the new position you are seeking. If you don't want to focus on the degree you have, which doesn't relate to the job, and, if you don't have a lot of past relevant experience in the industry, consider using a skills-based resume instead of a chronological one. You can list your degree at the bottom of the resume after detailing the skills you have that can get you hired. Develop talking points to use in your interview and cover letter: These talking points should provide clear, concrete examples of how you obtained on-the-job experience in the skills the hiring company is seeking in a candidate. Another great way to get a job outside of your degree is to work with a staffing agency. Eastridge Workforce Solutions can help you land interviews with companies that have an open position your skills would be a fit for – even if you don't have a relevant degree. To find out more about how our staffing agency can help you, give us a call today.